We usually make an extra effort while visiting a gynecologist and make sure we are presentable enough. 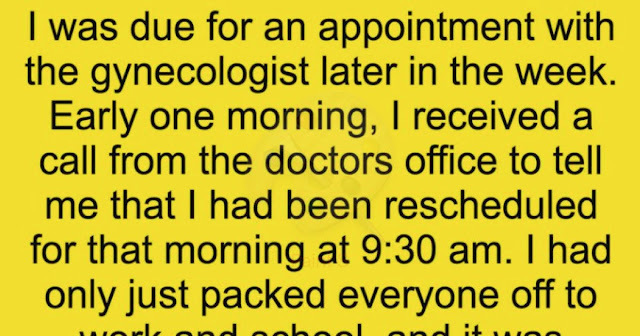 This woman’s experience while a gynecologist visit will make you cringe. Gynecologist visits are necessary for a woman's health. This woman didn't expect something this weird to happen with her when she visited her gynecologist. It was time for an appointment with the gynecologist. One early morning, I received a call from the doctor's office to tell me that I had been rescheduled for that morning at 9:30 am. I had only just packed everyone off to work and school, and it was already 8:45am. The trip to his office took about 35 minutes, so I didn’t have any time to spare. I like to take a little extra effort over hygiene when making such visits, but this time I wasn't going to be able to make the full effort. I rushed upstairs, threw off my pajamas, made the washcloth wet that was near the sink, and gave myself a quick wash in that area to make sure I was at least presentable. I threw the washcloth in the clothes basket and hopped in the car and raced to my appointment. I was in the waiting room for only a few minutes when I was called in. Knowing the procedure, I jumped up on the table, looked over at the other side of the room and pretended that I was in Paris or some other place a million miles away. It was surprising when the doctor said, My, we have made an extra effort this morning, haven't we? I didn't open my mouth to respond. After my visit, went home relieved. The rest of the day was normal… Some shopping, cleaning, and cooking. When my 6-year-old daughter was playing after school, she called out from the bathroom, saying, "Mommy, wheres my washcloth?" She replied, "No, I need the one that was here by the sink, it had all my glitter and sparkles saved inside it." I am never going back to that doctor again. Never ever!